It’s the start of a brand new month, and you know what that means – eight more spanking new restaurants for you to check out! This Greek deli cafe-and-grocer is bound to take you back to the sun-soaked islands of Greece with their handpicked selection of premium Greek products, artisanal coffees, wine, and other delicious menu items to chow down on! Also, great news for brunch lovers: their first ever outlet in Asia is set to win you over with a specially crafted brunch menu that showcases hearty Mediterranean fare. Yum! Fans of fugu rejoice, for Japan’s largest tiger puffer fish restaurant chain has just opened its first-ever overseas outlet in Singapore! Enjoy the dangerous dish (no, really, the smallest mistake in its preparation could be fatal) – and rest easy knowing Guenpin Fugu Restaurant has over 30 years of experience, in a variety of different preparation styles. This is THE place to experience the Japanese delicacy without having to travel to the land of the rising sun! Steamroom with The Pillar and Stones is a multi-concept space at Orchard Central, tucked away from the hustle and bustle of the buzzing Orchard Road despite being mere steps away. 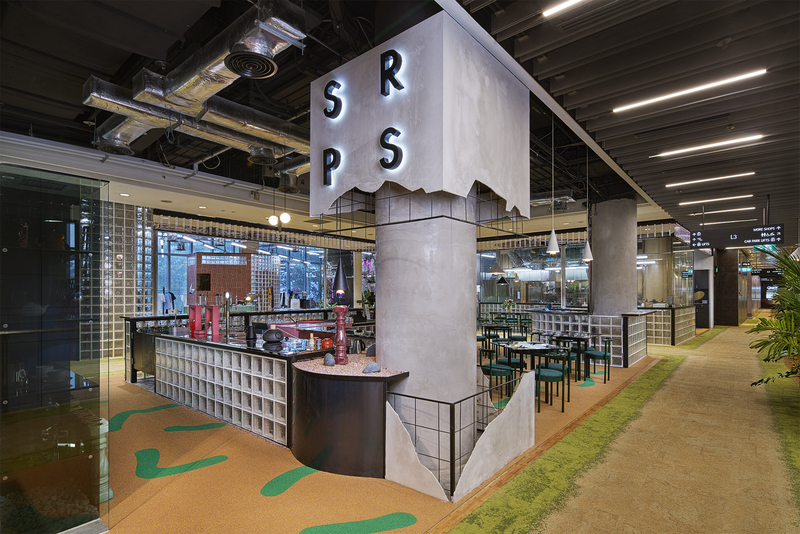 The space houses a “kaffatea” room (Steamroom), restaurant (The Pillar), retail and art lab (Stones) – it’s a quirky little bistro that integrates art and specially curated retail pieces that are bound to delight your senses while you tuck into all the delights they have on offer! Some dishes you need to check out: Lobster Fergola Sarda Pasta, 2015L Slider, Sundae Bloody Sundae. (Yep, that song is stuck in my head now too). The Masses is the brainchild of Chef Dylan Ong (one of the former co-owners of Saveur) and strives to serve ‘contemporary happy food at low prices’, something they definitely weren’t kidding about – everything in the menu is priced below $20! Give their version of Sotong a whirl: it consists of tender sous vide Australia Fremantle Octopus charred on binchotan coals, served alongside pickled lotus root with gochujang aioli. Delish! Brine Restaurant is The Laneway Market’s sassier and more experimental younger sister – they’re operated by the same folks, but Brine has deviated from the standard hipster cafe scene to bring you exquisite tasting menus with a contemporary twist on the classics. Pop by for their 5-course tasting dinner menu and tuck into aburi-ed Tenderloin Tatare with wasabi mayo and lotus root, Mussels cooked with garam masala and served alongside papadum and freshly grated parmesan, and deliciously creamy homemade ice cream. It’ll be a meal you won’t forget! Bistro November sets itself apart from all the other new restaurants in Singapore thanks to their ever-changing market-driven menu – everything you’re about to chow down on is purchased fresh from Chinatown markets in the morning and prepared based on whatever ingredients they have on hand, making each visit a unique experience. It’s a place unlike any other, and definitely somewhere you’ll never tire of visiting! #WTF stands for Wine, Tapas & Friends, so why not head down after a tiring day at work? Grab a bottle of amazingly-priced wine off the rack (indecisive people beware: there are so many options you’ll be standing there for at least an hour), order an assortment of delicious and unbelievably affordable tapas (pro-tip: #wtf sliders are amazing), and invite a couple of people you love for a casual get-together. You’ll be recharged in no time – there’s really no better way to celebrate the end of a long week! Salmon Samurai is a donburi place that serves up…you guessed it, salmon! The fish is delivered to the store on a daily basis and sliced upon order, so expect nothing but fresh, buttery, melt-in-your-mouth pieces of salmon, done up however you’d like – poke style, with mentaiko, sashimi-style, aburi-ed, over udon, ume rice, salad, or on a sushi roll… The possibilities are endless! The best part? It’ll only set you back $9.90!